November 2018 saw the hundredth anniversary of the outbreak of the German Revolution. It was part of a working class revolutionary wave which brought to an end the imperialist slaughter of the First World War. To understand the significance of those dramatic days the CWO not only called the above meeting but invited comrades from our German sister organisation in the Internationalist Communist Tendency, the Gruppe Internationaler SocialistInnen (GIS) to assist in our deliberations. The meeting was one of the best attended in a long while and all the more gratifying was the fact that around half those assembled were under 25. In this report we are not going to dwell on the introduction since it was partly a repeat of our article A Hundred Years On: Lessons of the German Revolution  but given the impossibility of covering everything in such a complex experience the talk concentrated on two key issues. The role played in the counter-revolution by the German Social Democratic Party (SPD) and the failure of revolutionaries inside Germany to form the nucleus of a revolutionary party after the SPD voted war credits for the Kaiser in August 1914. Obviously the two are related and the discussion from the floor not only recognised this but also made the obvious comparison between the events in Russia before the 1917 revolutions and the situation in Germany. The Social Democratic Party was undoubtedly the “class movement” in Germany from its foundation in 1875 on. It gained a reputation as a radical working class party under Bismarck who banned it from 1878-90. Its MPs however had Parliamentary immunity and thus the party could continue to grow electorally. The party was also never a purely working class party. Many German liberals, disappointed by the failure of their own ideology to create a real parliamentary democracy joined it after 1878. And as another comrade said, although the SPD had Marxists in it, it was not a Marxist party. Evidence for that was the Critique of the Gotha Programme by Marx and Engels which harshly criticised the whole basis on which the SPD had been founded with its concessions to Lassalleanism. As our GIS comrade pointed out Engels had also warned its then leader, Bebel, in 1884 about the role parliamentarianism could play in the future. It was a prescient observation but Engels could not possibly have guessed just how precisely the SPD would fulfil the role of leading reaction in 1914-21. Engels continued to criticise the SPD for its stress on the peaceful road to socialism and also some of its members (like Herr Eugen Dühring) right to the end but many of his criticisms were edited or watered down as he himself complained shortly before his death. In fact the SPD was in a strange position given the nature of the German Imperial constitution of 1873. Although it came to be the largest party in parliament the Reichstag had only one power – to vote on the budget. The government was appointed by the Kaiser and not responsible to Parliament. This allowed the SPD the luxury of a little socialist rhetoric without having to worry about actually acting on it. In the meantime the SPD built itself up as not only a mass party but as almost a working class state within a state. It had its own papers in every town, its own offices and social centres as well as a whole host of ancillary activities covering almost all aspects of social life right down to singing and cycling clubs. It was becoming comfortable inside imperial Germany and in the economic revival of the last years of the nineteenth century there were those who questioned whether revolution was needed at all. The mass party would simply keep on growing until it eventually became the ruling power. The debate on revisionism, launched when Eduard Bernstein suggested that class war (and by implication Marxism) was now obsolete, often attracts the attention of revolutionaries, but this was an ideological dispute between the intellectual leadership of the SPD. It was Karl Kautsky who acquired his unearned title of the “Pope of Marxism” in leading the assault (alongside Rosa Luxemburg) on revisionism. Revisionism was “defeated” programmatically but the SPD’s real problems lay elsewhere. The German Social Democratic Party, and especially its trade union leadership, was not only not Marxist but actually had a pro-imperialist wing (or in the language of the day “colonialist”) and racist. This included the main union leaders David and Legien. Both advocated white supremacy, in one form or another. David got involved in a brawl with SPD members at the 1907 Stuttgart conference when he attempted to rig the vote in favour of supporting German colonialism whilst Legien was an anti-semite even against members of his own party. When the USPD (Independents) were splitting from the SPD in 1917 he announced that it was time to get rid of the “Jewish gang”. “National socialism” did not spring from nowhere in 1920. Despite all this the SPD was the largest party in the world with its one million members and still contained Marxist revolutionaries like Rosa Luxemburg, Clara Zetkin, and Karl Liebknecht. And the revolutionaries always clung to the view that, whatever else was going on inside Germany, in the event of war, the Second International resolutions passed in 1907 and 1912 would ensure that the working class would be mobilised to halt imperialist war. This expectation was rudely shattered on August 4 1914 when the SPD parliamentary faction unanimously voted for the Kaiser’s war budget. It is difficult to understate what a blow this was to the working class. The one organisation dedicated to internationalism, in the wake of the German vote now collapsed and one by one, all its constituent parties found excuses to renege on the resolutions they had voted on before the war. Only the Russian Social Democrats and the parties most closely allied to them in Poland, Bulgaria and Serbia stuck by internationalism. The question now posed was how should revolutionaries react. In Russia Lenin was quite clear. He pronounced that the working class had to turn the imperialist war into a civil (by which he meant class) war. He spent the next two years attacking all those who came up with their various excuses for supporting the war, reserving special venom for those like Kautsky who pretended that the imperialist war was unconnected to the class war and that socialists should just call for peace so they could get back to where they were before. The German SPD in its bloated condition of major property owner, with an army of functionaries, many paid fifteen times the wage of a worker, had quite clearly gone over to supporting the capitalist system. To break with it would not be easy since any new political formation would have to start from scratch with few resources. Rosa Luxemburg did not think it possible. “Better the worst working class party than none at all” was her early response. It was here that the real tragedy of the German Revolution began. The failure of the Internationale group of Liebknecht and Luxemburg to split and begin the process of rebuilding the revolutionary movement was critical to the fight within the German working class. The fight would have to be clandestine and patient to build up confidence in the new organisation as the war crisis took hold but the leaders could not abandon the idea that any party had to be a mass party. Luxemburg looked to the mass movement to create the opportunity for a new party when in fact it was the foundation of a revolutionary party which was needed to point any new mass movement in a revolutionary direction. The Internationale group only split from the SPD in 1917 and even then only as a faction inside the largely pacifist and centrist (it was after all the party of Bernstein and Kautsky!) Independent Social Democratic Party (USPD). And hidden inside this amorphous grouping they not only made little impact in Germany. Even on the international stage at Zimmerwald and Kienthal they did not sign up to the revolutionary manifesto of the Left (led by Lenin) but to the pacifist manifesto of the Kautskys etc. What message was this for the working class in Germany? It is true that the objective situation in Germany was much more complicated and confusing than in Russia, as comrades pointed out. It was also true that the Russian workers had experienced the 1905 revolution which taught them enormous practical lessons and gave them the soviet form which they returned to in 1917. But in both countries real power lay with an Emperor and in both countries those who opposed the war had to flee, hide underground, or like Rosa Luxemburg and Karl Liebknecht go to gaol. The Bolshevik leadership in Russia was decapitated several times over (and hundreds of them went to prison) but a new set of comrades always emerged from the ranks of the working class to carry on the fight. In Germany, on the other hand, there was no shortage of able leaders and there was a ferocious class war going on. 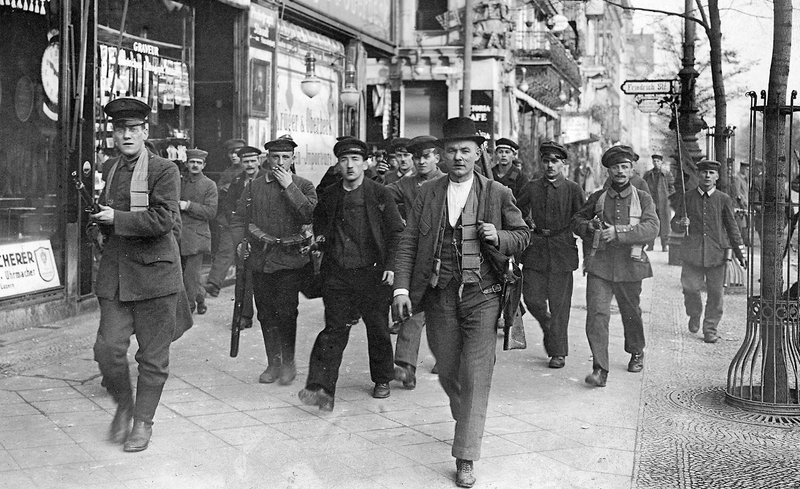 The problem was that the imperatives of that class war constantly forced revolutionaries who only organised after the revolution broke out to chase after events and be driven into premature and putschist adventures like that of January 1919. Given the above scenario it was therefore surprising that a member of the Internationalist Communist Current (the only other organisation present in the meeting), and whose other comrades made positive contributions to the discussion, should pose the question that August 1914 was too early for the Internationale group to split from German Social Democracy. He surprisingly argued that August 1914 was not a definitive betrayal of the international workers’ movement. We replied that the two cases of Germany in 1914 and the Italian comrades in the 1920s were not the same. As the foregoing analysis shows, the SPD’s vote for war credits was a clear and obvious betrayal of the working class cause. And this judgement is not the product of hindsight. There were other socialists at the time (like Lenin, but not just him) who loudly said so. The need was for a new banner around which the revolutionary working class could rally. The sooner that banner was raised the quicker the revolutionaries could get to work to build for the movement which would break out, sooner or later, against the war. And the fact that Germany was a federal state saturated in localism made this task all the more urgent. In Russia the Bolsheviks were estimated at only 8000 – 10,000 in number at the start of 1917 but they were present in almost every town or city and, more importantly, embedded in the wider working class. Thus when the revolutionary movement arose they were not only able to give a lead but grew inside it. Workers had called spontaneously in February 1917 for “soviet power” (based on the memory of 1905) but by the summer of 1917 it was clear that only one party supported “all power to the soviets” and this party in most estimates now had 300,000 members. In Germany, even if the revolutionaries had started on the process in 1914 there is no guarantee that they would have succeeded, given the hold the SPD had over the workers’ movement, and given the federalism and localism which bedevilled the political scene in Germany (which Rosa Luxemburg made an excellent critique of in Order Reigns in Berlin). However the economic crisis was so deep that strikes and uprisings, calls for soviets and social turmoil carried on right into 1923. Had the preparations for a communist party started in August 1914 and not in December 1918 (after the revolution broke out) then whole experience in Germany would undoubtedly have been different. The whole episode underlines the fact that without a revolutionary working class nucleus around which a party can be built there is not the slightest possibility of a successful outcome for our struggle. As it was in Germany the Communist Party (KPD) split. The original KPD oscillated between putschism and united fronts with the SPD who had murdered so many workers, ending up in the sorry story of National Bolshevism in 1923. Those who split from it in 1920 formed the KAPD but this was bedevilled by localism, councilism (the councilists under Rühle left after a few months) and syndicalism so that it was unable to achieve united class action. Despite all the enormous class sacrifices of those years the Weimar Republic had survived thanks to the SPD. And thanks to them the old order remained in power – the Army High Command, the civil service and the judiciary were exactly the same as the Kaiser’s. Hegel wrote that “people learn history but do not learn from history”. Today we are facing a capitalist system which is not only placing the planet in danger of being unable to sustain life it is also in an acute and long term crisis only partially staved off by the accumulation of a vast pile of debt which threatens yet another disaster in the not-so-distant future. The failure to find any real economic solution is slowly forcing the ruling classes everywhere to take more extreme nationalist stances, tearing up treaties, shutting down trade and creating new bases from which to project their power. They don’t want war but they don’t want to give ground to their rivals either. To escape its long stagnation capitalism needs to devalue to allow a new round of profitable accumulation to begin. Ideally what each power wants to do is degrade the value of the rival powers’ capital (whilst leaving their own largely untouched) but this just opens up the path to a more generalised conflict. And though that war is as yet some way off  the capitalist mode of production's continued crisis means that the options are narrowing. If there was more evidence required to demonstrate how decadent the system is we don’t know what it is. There is definitely a sense that things cannot go on as they are. We are already seeing the growth of a poisonous nationalism which is slowly enveloping even elements of a working class which has seen its standards of living and way of life disintegrating over 40 years. At the moment it plays on the fact that the working class is more and more exploited. Our class responses to austerity so far have been few and inadequate. Although today there is no SPD with its fake socialism so entrenched inside the working class but there still are plenty of wannabe SPDs out there whose reformism has to be fought. However all the features we have underlined so far are the things over which we have no control. There is one thing we do have control over and that is our own self-organisation. Around the world it is clear that a new generation is coming to the politics of the communist left and that throws up new challenges for organisations like the Internationalist Communist Tendency. Establishing a clear revolutionary stance through applying Marxism to contemporary reality is our starting point but we cannot confine ourselves to that. As Onorato Damen said revolutionary politics “cannot be restricted to a typewriter”  This is not a time for fractions or discussion circles. It is time to form nuclei of revolutionaries everywhere and for them to converge in the creation of an international and internationalist revolutionary party in preparation for the inevitable class conflicts of the future. The party (the Internationalist Communist Party) was thus not founded until 1943 in response to a new wave of struggle in Northern Italy which had echoes in other places. The current cult of Corbynism is a case in point. Its policies like putting workers on company boards alongside shareholders sound radical but are in fact similar to the Stinnes-Legien Agreement of 1919 where the SPD unions agreed to calm workers’ struggles in return for the setting up of works councils. It has been the basis for German capitalism’s “social peace” ever since.